So Kei Kan'nin (Kan'nin means an official) was a resident of Mingzhou (near present-day Ningbo, Zhejiang province), China. 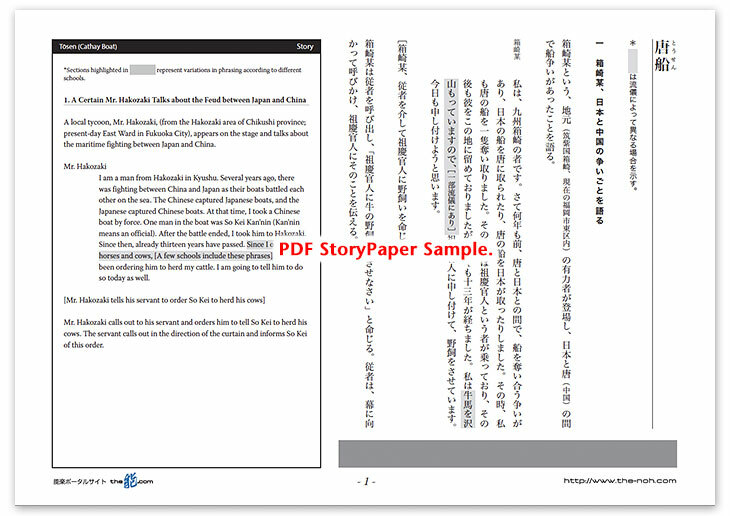 One day, during a maritime battle between China and Japan, So Kei was taken prisoner. He was transported to Hakozaki Bay, Chikuzen province (present-day Fukuoka prefecture, Japan), where he was forced into the service of a certain Mr. Hakozaki and made to work as a cowherd. There, So Kei took a wife and had two children. He has spent thirteen years in Hakozaki. So Kei left behind two children in Mingzhou. One day, his Chinese children load a boat with treasures intended for their father’s ransom and they leave China, traveling all the way to Hakozaki to bring him back to China. So Kei is extremely delighted to be reunited with his Chinese children. And Mr. Hakozaki, impressed by the children’s love and devotion to their father, permits So Kei to return to his home in China. When So Kei is about to embark on the boat to China, his two Japanese children ask to go with him. However, Mr. Hakozaki does not allow them to go, as he plans to make them continue to do So Kei’s work as a cowherd after his departure. So Kei is torn between his Chinese children, who hasten him to leave, and his Japanese children, who try to hold him back. Unable to reach a decision, So Kei tries to kill himself by leaping from a boulder. His Chinese and Japanese children hang onto his sleeves to stop him. Mr. Hakozaki is so deeply impressed by the filial love between father and children that he agrees to allow So Kei’s Japanese children to leave with him. Filled with joy, So Kei and all of his children board the boat and set sail for China. So great is So Kei’s happiness that he performs a dance of joy around the deck. The boat departs from the shore of Hakozaki and hastens its way toward China. In Japanese, the word “tang” (translated here as “Cathay”) can mean the historic Chinese Tang dynasty (618-907), the country of China itself, or other countries in general. The “tō” (Japanese, “tang”) in the title of this play “Tō-sen” (Cathay Ship), simply means China, and does not necessarily indicate that the story is set in the Tang dynasty. The age in which this story is set has not been determined, but customarily, it has been attributed to the Japanese Nanboku-chō era (1336-1392). Descriptions in the story indicate that it depicts the era between the thirteenth and sixteenth centuries, when Japanese pirates (called wakō) were active. In Zeami’s time, there existed a play with similar content, called “Ushi-hiki-no Noh” (Noh about a cowherd). 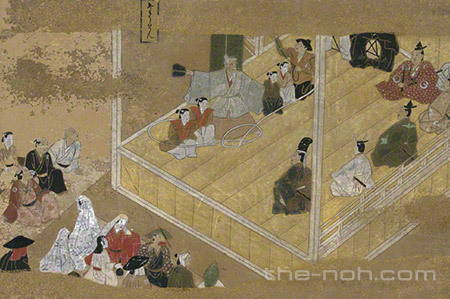 In the realm of the literary arts, very few stories exist relating to Japanese pirates, which makes this Noh play, Tōsen, rather unique. This play has many characters, a dynamic story, and a number of highlights, all of which are attractive to its audience. First, the lead character (shite), So Kei Kan'nin, and his two pairs of children, from China and Japan, appear on the stage and express their filial love. Then, the scene in which those four child actors (kokata) cling to the shite’s sleeves to stop him from killing himself makes a profound impression on the minds of the audience. Also, the unique prop of the Cathay boat is eye-catching. The structure of the boat used in this play is larger than those used in other plays. Its appearances on the stage are divided into three. When sailing on the ocean, it raises a colored or patterned sail. This prop is a Chinese wooden boat, called a junk, which is a good representation of the Cathay boat. The scene in which the shite joyfully dances on the deck of the boat is another highlight of this play. He performs the dance on the boat, surrounded by his children and a boatman. Although the performance takes place in a limited space, the tempo of the dance changes and it is quite enjoyable. The chants of the chorus provide insights into how the Japanese people of those days viewed China as well as how the Chinese people viewed Japan. This is a play with numerous scene changes, offering the audience a wide variety of attractions.